You want to go? Yeah, sure. OK. Let’s go. On a Sunday, the city is only a 10-minute drive from home. No traffic. We put on our Nike’s and we’re literally there, minutes later, looking at I’m not even sure what…amazing buildings. 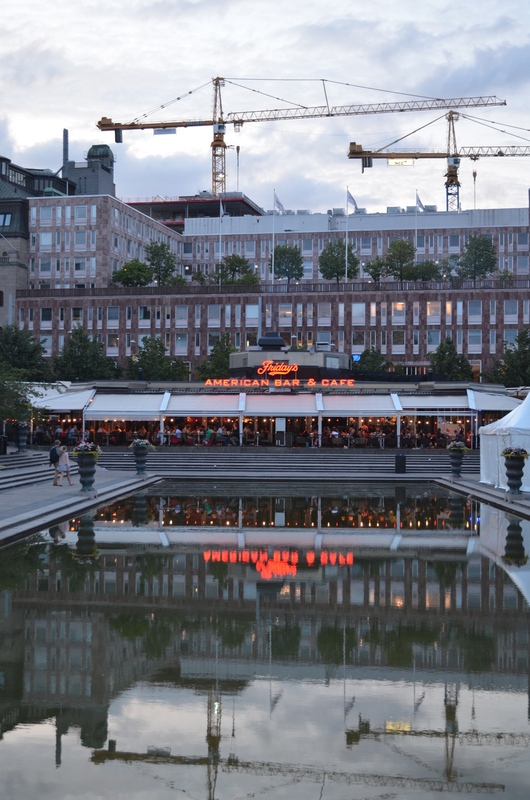 That’s what they are, amazing, overlooking the waterways that take you directly to the Baltic Sea. The weather is perfect. People are gathering at outdoor restaurants, sitting in parks, eating ice cream. 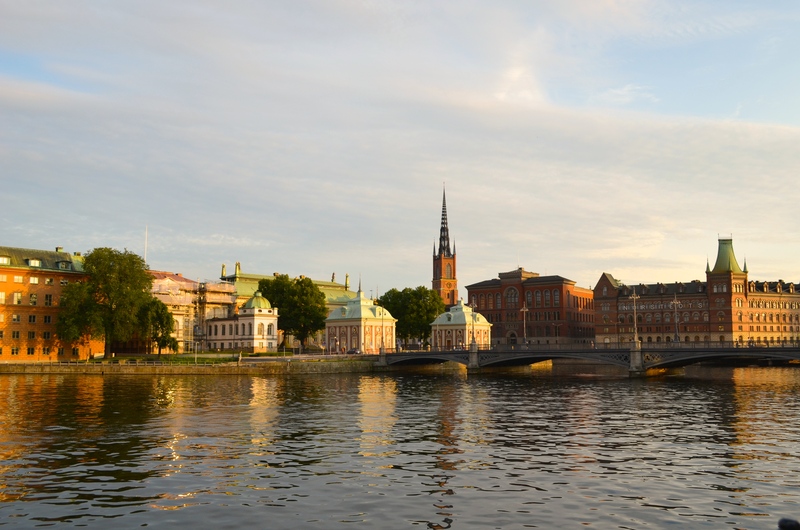 I look at Cooper and say, “We live in Stockholm.” I forget sometimes, when I’m busy being a mom, that I actually have access to all of THIS, all of this culture and beauty. I’m glad I brought my camera. I’m glad I decided to venture out. I’m glad I’m with Cooper and that we have four kids and that we move every couple of years. 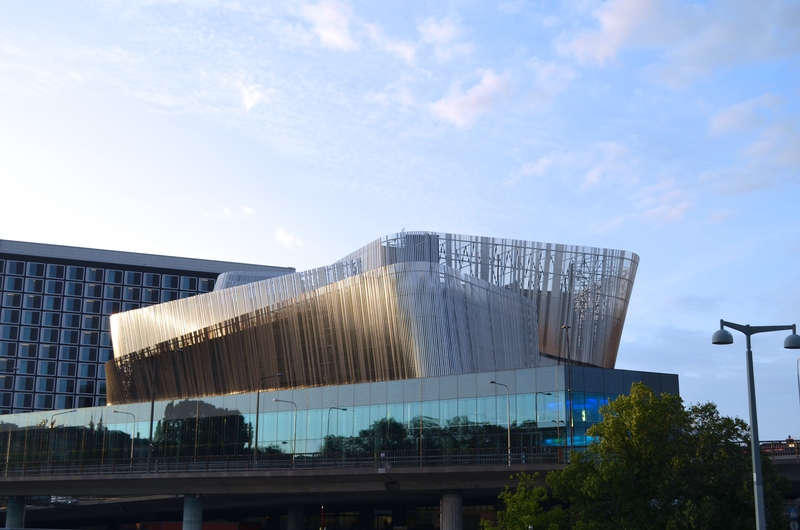 Suddenly, I’m glad about everything, including this modern structure. I have no idea what it is, but I like it, the vertical steel folding out and in on itself like a roll of wrapping paper come undone. 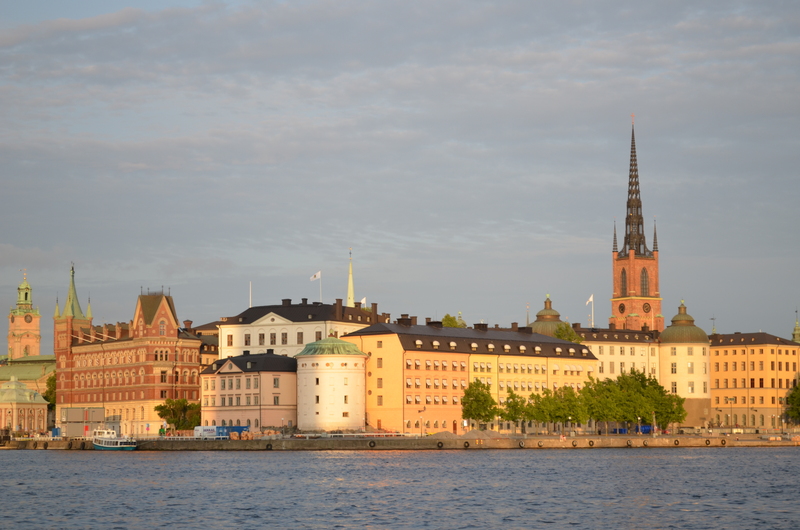 Stockholm is mix of modern and old, eclectic and dynamic, one moment steel and glass, the next, a turn back in history to Romanticism and Baroque. It’s like one huge museum. 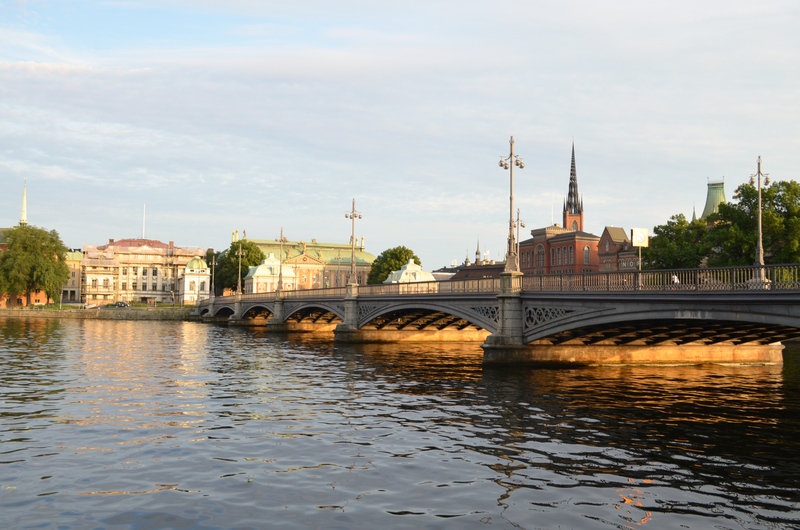 We walk along the bridge to Gamla Stan “the town between bridges,” and take in the views of the Royal Palace. This is the oldest part of the city, dating back to the 13th century. History abounds. From here we can see the harbors of Skeppsbron and Sodermalm. I love all the bridges. They’re romantic…something about hovering above the water, the endless deep, catching shadows of your reflection. It’s dreamy. 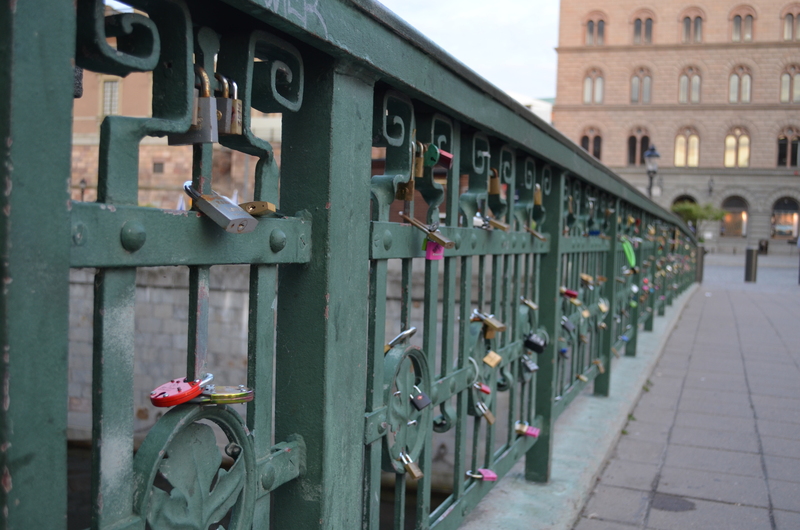 It’s become the trend for couples to celebrate their love by putting padlocks on bridges. And this bridge has its share, locks in various sizes and shapes, some with lovers initials, some with the traditional plus sign, “Axel + Anna,” the equivalent of carving names into a tree surrounded by a big heart. Love in the 21st century. We move on, walking under the freeway, the E18. I’m not sure why this fascinates me so much. 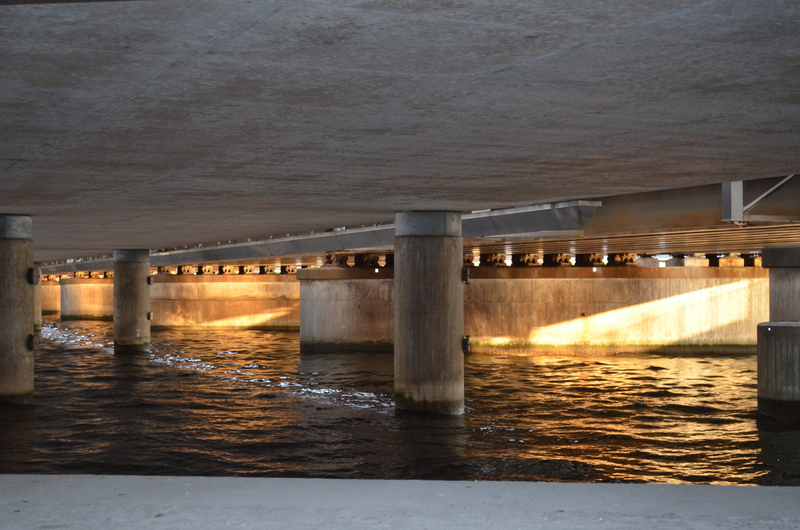 I pause, staring at the concrete pylons, the light reflected off the water, the magic that’s holding up the bridge. How is this holding up the bridge? I think this “underground” has a cool vibe, like it should be in a music video, and the name of a band should be, Under the Bridge. Urban grunge. But then I smell urine (another scent of the city), so we don’t linger for long. 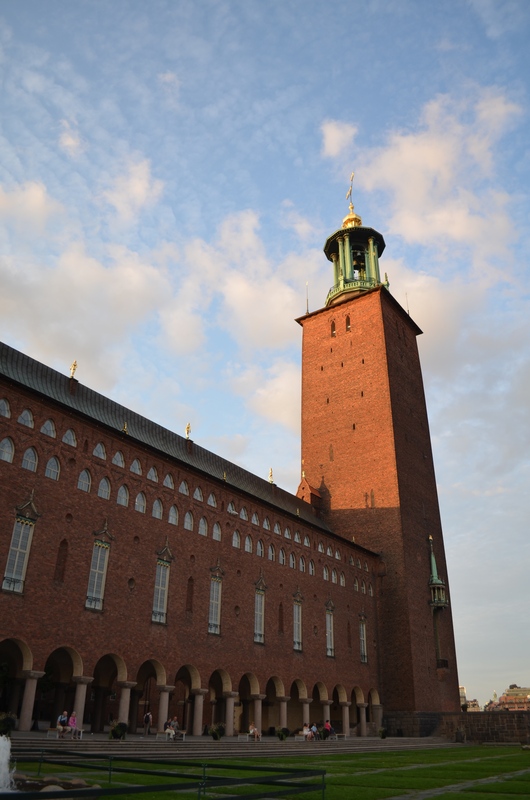 On the other side we emerge and behold…ta, da, da…a massive turreted building, Stockholm City Hall, also known as Nobel Hall, (this is where the Nobel Prize banquet happens). Built between 1911-1923, it took twelve years and nearly eight million red bricks to put this thing together. I’m in awe. I can’t stop looking up at the golden starlet at the top. I almost trip over myself. I look down to see where I’m stepping and notice the surrounding gardens are magnificent too, a maze of hedges. People are sitting, relaxing, enjoying the views. There’s a man taking pictures of his girlfriend, couples with strollers and kids darting about. It’s a big hit with the tourists, I think, smiling, feeling local (wink). The sun is going down. I want to get back across the bridge, take a few more pictures, before daylight is gone. We exit the courtyard and as we make our way back, we hear music. 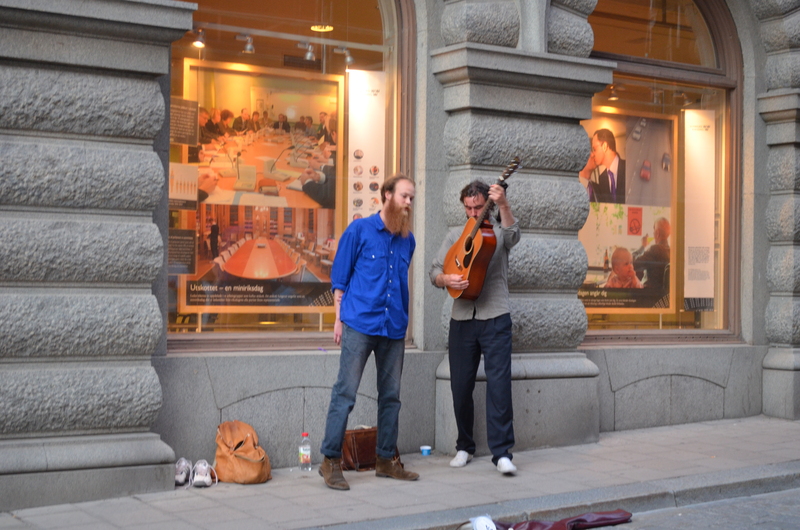 Two American folk singers. Their harmony is pitch perfect. Cooper and I hold hands, listen for a while. I feel like I’m back in college. But then the song ends, I remember I have kids and think, they’re probably hungry, they’re probably fixing PB&J’s by now, someone has probably found the ice cream sandwiches I’ve hidden in the freezer, and I don’t even care. I’m having way too much fun to worry about nutrition. We cross another bridge and it’s dusk. We pass a coral red church. The sky is luminescent. The flowers are in late summer’s full bloom, a pulsing scent of sweet musky fragrance is carried on a light breeze. I breathe deeply. We’re getting closer to where we parked, but before we do, I spot TGI Fridays. I see the blazing “American” sign and feel proud. Because there are Swedes in there eating plates of American ribs and molten lava chocolate cakes, washing it down with Coke-a-Cola and getting a little taste of home, my home. 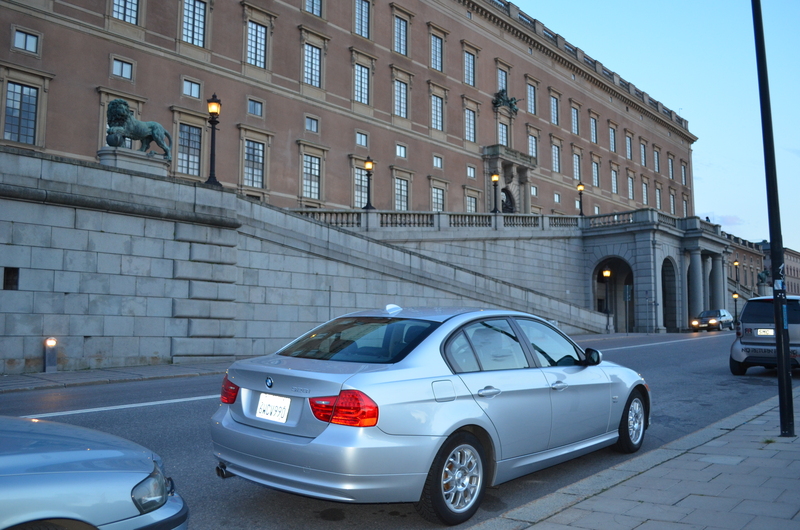 We find our car, with our California plates, and I suddenly think…it’s our last year in Sweden. I have to make the most of it, take nothing for granted. I hope that’s possible. This isn’t a typical Sunday. I usually don’t bask in all Stockholm has to offer. I forget. But this is a start, right? A pretty good start. Yes, unfortunately, every city seem to have that scent in one place or another. 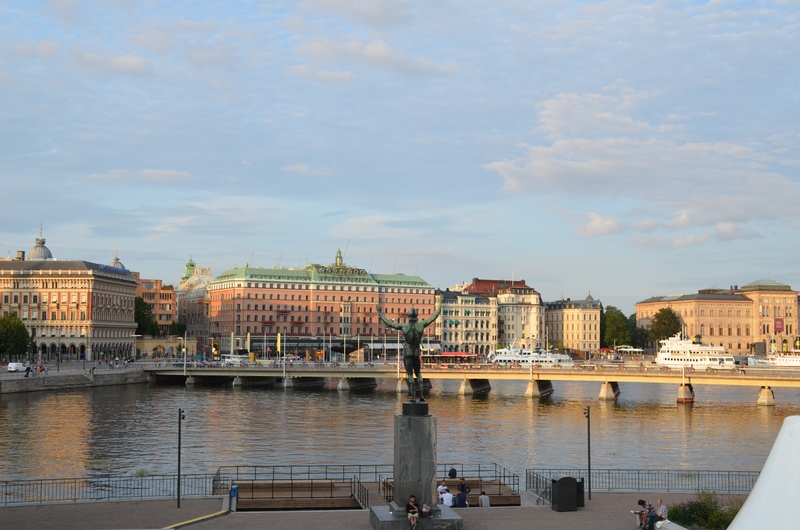 Luckily, most of Stockholm is clean and beautiful. What a wonderful walk. How long did it take? There were so many different scenes–it felt like miles. It only took an hour. 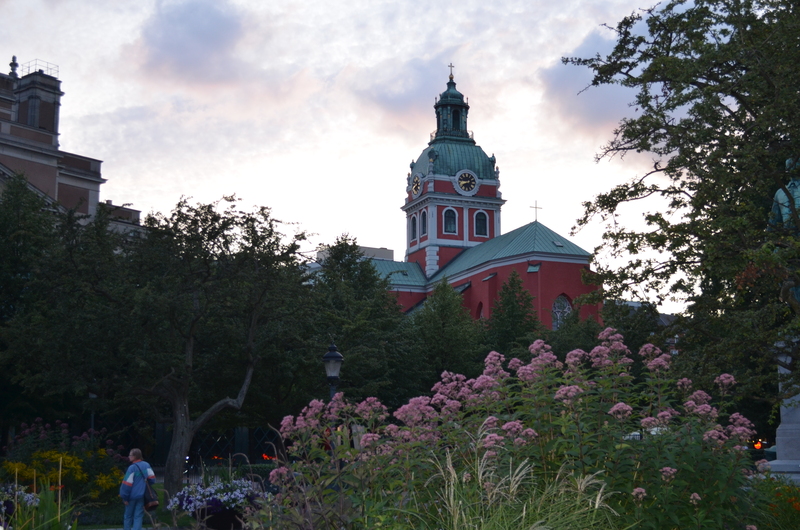 Stockholm is packed with beauty! I find something new every single time I go into town.